The Berkshire Museum facade is due to be gutted as a part of director, Van Shields, dubious "New Vision." 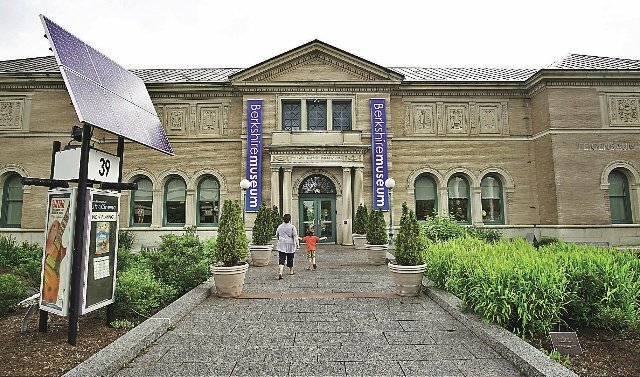 With callous disregard of a moral covenant to preserve works by deceased artists in its collection, with legerdemain and chutzpah, The Berkshire Museum is extending a cynically calculated olive branch to living ones. After a year of controversy and protests, including many artists, the museum has legally prevailed in selling off a treasure trove of its fine arts collection to fund an ironically titled “New Vision.” Courts have ruled that the museum may proceed to gut its collection. The sales violate commitments to Norman Rockwell and other donors disregarding every moral and ethical mandate for American Museums. This week, as sales of the museum’s treasures are on the block at Sotheby’s in New York, protests continue in front of the renowned auction house. It may be appropriate for pickets to walk in front of the Berkshire Museum “celebration” on Saturday, June 2. Hype for the summer long, juried show Art of the Hills sounds enticing. “Meet the artists, celebrate the creative community of the Berkshires, and be among the first to see the artwork included in Art of the Hills! “Guests at this free community reception will enjoy complimentary refreshments including beer, wine, and signature cocktails from Berkshire Mountain Distillers. The press release further states that “Forty-two works of art by 36 artists were chosen by juror/curator Ryan Seslow through a blind jurying process; the exhibition includes painting, drawing, mixed media, printmaking, photography, and sculpture." Never having heard of the juror, Ryan Seslow, I Googled him. Given his credentials and images on the website he appears to be an illustrator, educator and commercial artist. That’s not at all the norm for jurors of a museum level exhibition that calls for an established curator. Under the inept leadership of director, Van Shields, and board chair, Elizabeth McGraw, the museum, for the past several years, could not afford or saw no need for a “curator” on staff. When Sothebys cherry picked its way through the collection there was nobody in house to speak for retaining key works. Shields handed over keys to the vault and cordially hosted its looters. While many artists in the community held fast and manned picket lines we are told that 230 artists within a 60 mile radius of the museum applied for the exhibition. It is understandable that artists respond to an opportunity to show their work in a museum. But this “ecumenical” offer from the museum has the deconstructed agenda and marketing ploy that artists accept and endorse its draconian, barbaric strategy for survival. The artists selected for Art of the Hills include: Baker-White, Madeline Bohrer, Michael Boroniec, Michael Bufis, William Casper, John Clarke, Laurie May Coyle, Laura Didyk, Julia Dixon, Helen Evans Febbo, Jacob Fossum, Joe Goodwin, Robert Hill, Patricia Hogan, Crystalle Lacouture, JD Logan, John MacDonald, Ben Mancino, Jesse Tobin McCauley, Scott R. McClintock, Sean McCusker, Robert Morgan, Lynne O’Connell, Bruce Panock, Bryan Powers, James Singelis, Anne W. Smith, Nelena Soro, Ilene Spiewak, Paula Stern, Rose Tannenbaum, Barbara Shea Tracy, Joseph Tracy, Margot Trout, Katherine Ryan Waiveris, and Rachael Warnock. I know and respect some of these artists as well as others who applied. They are to be congratulated for having their work shown in a museum. Hopefully, they will understand why I will not attend the opening, view their work, or review the exhibition. "I also demurred! The nerve!" "Van Shields looks like the cat who ate the canary. He could, because he did."